you are in the right spot. If not, head back to Lissa Marie's blog so you don't miss a thing! Please grab your cup of coffee or favorite beverage, relax as you browse through the awesome bright and cheerful projects we have made for you, and get ready to win some blog candy! 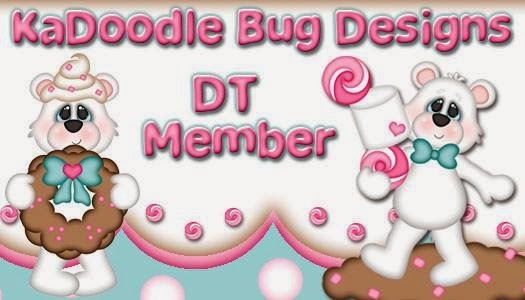 Another great reason to comment on each blog other than leaving a blogger feeling warm and fuzzy inside, is so you can also win with some blog candy too! I love Sunshine so when I heard about this hop I immediately said, " IM IN"! This is what I have made for you today, this makes my day feel like there is a little more sunshine in it. so I opted for a Peachy keen face stamp from the Boy Mates set! also some of the new Rainbow Teal Shimmer Twine which you can pick up in my online shop! Now for the good stuff! 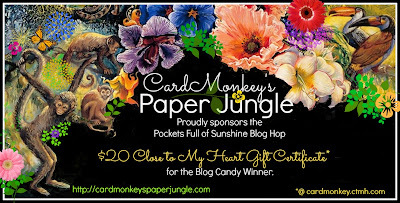 Our sponsor today is Ellen at CardMonkey's Paper Jungle. She will be awarding a $20 Close To My Heart gift certificate to one lucky blog hopper. To be qualified for this drawing, please comment on all participating blogs. Just be sure to leave a comment at So Many Crafts, So Little Time to let us know you have done your part to be entered into the drawing. Don’t forget to keep an eye out for more blog candy offered throughout the hop. Some blogs are offering extra perks on their own! If they are offering even more blog candy. they all have their own requirements for you to win, so don't forget to read the rules for each one. Thank you for taking the time out to check out my project, if you like my project and you are not already a follower, you are encouraged follow! Keep clicking for more Pockets Full of Sunshine! 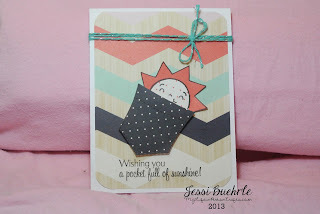 Here is the line up to help you navigate through..
cute card, great job as usual! i love the shimmer twine. I used your jute twine in mine! What is the paper? lovely card. so long to creepy faces. Nice project & smiley sunshine peeking out of the pocket. Your card is adorable. TFS. 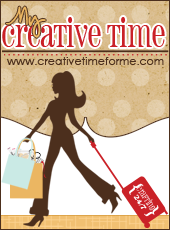 I'm a crafty friend of Ellen's and found this hop through her blog. Cheery card! Thanks for the inspiration and the giveaway! Thanks for sharing your pocket full of sunshine.